The horrifying massacre at a gay nightclub in Orlando forces us to ponder whether it will somehow change the national electoral calculus. The short answer is that it's too soon to tell, but the grim reality is that the frequency of mass murder in the United States -- committed by ISIS-inspired lone wolves or others -- suggests that this, terrifyingly, might not be the last major spasm of violence that takes place between now and the election. How candidates react could have consequences in November, although it's also easy to overstate the potential impact of jarring events on the choices that voters make. After all, the American electorate is partisan and the vote choices for the vast majority of them don't waver much throughout the campaign. But the Orlando attack could have other political consequences. As the clock ticks down to a June 24 filing deadline, Sen. Marco Rubio (R-FL) gave his strongest signals yet that he might be reconsidering his decision not to seek a second term following his loss in the GOP presidential primary. Speaking with conservative radio host Hugh Hewitt, Rubio said 1 that the attack gave him “pause to think a little bit about, you know, your service to your country and where you can be most useful to your country." On Wednesday, Rubio confirmed 2 that he was reconsidering his decision not to seek another term. Ultimately, only Rubio knows whether he will run again. He and his staffers have insisted that he will be transitioning to the private sector next year, and there is some indication 3 that Rubio really does want to spend some time outside of politics in order to refill his family's coffers. However, we also know from experience that statements disclaiming interest in running for office are operative only until they are not. And perhaps Rubio's calculus truly has changed after spending time in Orlando after the shootings. We'll find out soon enough. But we did want to note in advance that, at least at the outset of a reconfigured race, Rubio changing course and seeking a return to the Senate would not change our rating in the Florida Senate race. We would still call it a Toss-up. Rubio's star has dimmed after his presidential race, and he could potentially face problems in both a primary and a general election. For weeks, Republican leaders have been publicly leaning on Rubio to seek another term in large part because they believe Rubio, the incumbent, is by far their best potential candidate to hold the seat. They probably are right about that: None of the current GOP contenders has truly emerged so far, and the best candidate on either side might be Rep. Patrick Murphy (D, FL-18), who (despite some recent stumbles involving overstatement of his educational 4 and other credentials 5) is a very strong fundraiser. Murphy defeated an incumbent Republican in 2012 -- controversial Allen West -- and has won two terms in the House in a GOP-leaning district. We do not know what his re-entry might do to the current Senate field. One of the current GOP Senate contenders, Rep. David Jolly (R, FL-13), has already said he would drop out in deference to Rubio, and he may be planning to run for reelection to his House seat -- he is making an announcement 6 about his future plans on Friday (more on Jolly below). Two other candidates, self-funding developer Carlos Beruff and former CIA agent Todd Wilcox, have said that they will stay in the race regardless, and Beruff, who is in some ways a Trump copycat 7, has already spent 8 more than $3 million of his own money on ads and led the splintered field in a recent Mason-Dixon poll 9. Another candidate, Rep. Ron DeSantis (R, FL-6), has the backing of the conservative Club for Growth 10, but the Club likes Rubio too. And Rubio has been helping another candidate in the race, his friend Lt. Gov. Carlos Lopez-Cantera, and is scheduled to host a fundraiser for him on June 24, the filing deadline day. But Lopez-Cantera has apparently given Rubio the green light to run 11 and would step aside if he did, Politico reported Wednesday. Still, the incumbent's poor performance in the Florida presidential primary -- Donald Trump beat him by almost 20 points -- shows that Rubio isn't as strong at home as he might have seemed before he became a presidential candidate. Remember: Rubio upset Bush family loyalists when he entered the presidential race against former Gov. Jeb Bush, who started the 2016 presidential primary as a prime contender. Rubio surely would have to mend some fences with some Bush-backing Sunshine State Republican donors and rank-and-file. Additionally, Rubio could face criticism over what may look to some like opportunism -- effectively using the Orlando shootings as an excuse to reenter politics. That may or may not be fair, but Rubio would have to deal with that perception nonetheless. Then there's the general election. Republicans are hoping that Rep. Alan Grayson (D, FL-9), an acid-tongued liberal with ethical baggage 12, wins the Democratic primary over Murphy. Rubio would be favored over Grayson in a general election, and maybe other Republicans would as well. However, Murphy is probably leading in the primary, and we don't see much reason why he couldn't run closely with Hillary Clinton as both try to win statewide: The Democratic firm Public Policy Polling, in a recent survey, showed 13 Trump leading Clinton by one percentage point in Florida while Murphy led Rubio by one. If that's an accurate read of the electorate, and it might not be, it shows that Rubio has some work to do to demonstrate a bit of crossover appeal. Additionally, if Rubio runs, Democrats will flood the state with money in an effort not only to win the seat, but also potentially end Rubio's career before he has the chance to make another run at the White House. Interestingly, if Rubio ran he would in some ways be tying his fate to his one-time rival Trump: If Trump won Florida, Rubio would almost certainly win. If Trump lost Florida, Rubio probably would still have a chance, but he might not have much margin for error. In that, his situation would be similar to that of some of his fellow first-term Republican senators running for reelection, such as Kelly Ayotte (NH), Rob Portman (OH), and Pat Toomey (PA). We call all of those races Toss-ups, and to us Rubio has not earned any more benefit of the doubt than those other incumbents have. If Rubio does not run for reelection, we will still keep the race as a Toss-up, given the primary uncertainty on both sides. But if Murphy wins his primary and none of the GOP candidates proves formidable, we think it would be the Democrat's race to lose. The current Senate alignment is 54-46 Republican. 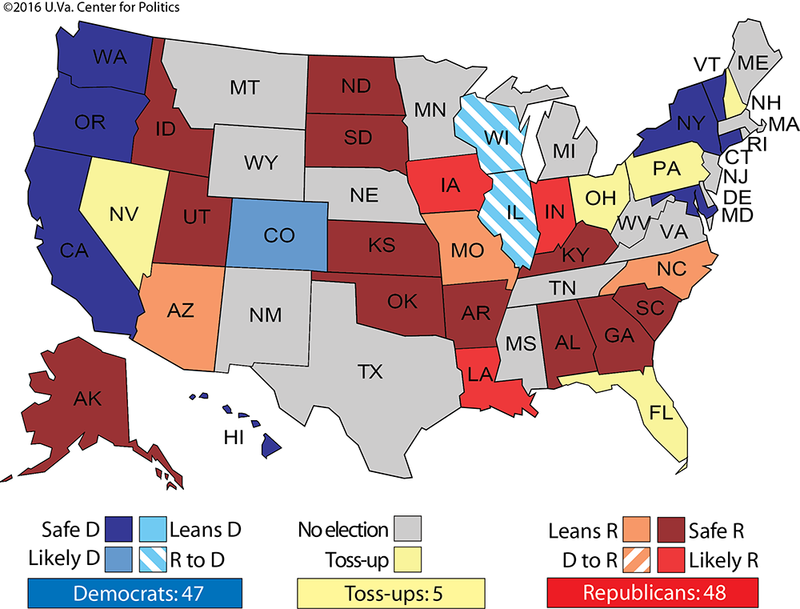 In our ratings, we have two current Republican seats, Illinois and Wisconsin, leaning to the Democrats. There are some signs that Republicans already view Illinois, where Sen. Mark Kirk (R) is trying to win a second term against Rep. Tammy Duckworth (D, IL-8), as a lost cause 14, while Sen. Ron Johnson (R) has trailed ex-Sen. Russ Feingold (D) in every Wisconsin poll so far. If Republicans can't play offense in Nevada, a Democratic-held Toss-up open seat where Trump is unlikely to be an asset thanks to a growing, diverse electorate, then the Senate probably comes down to one party winning three of these four seats -- Florida, New Hampshire, Ohio, and Pennsylvania -- to hold an outright majority, with a two-two split resulting in a tied upper chamber in such a scenario. There are 28 House seats currently held by Republicans that we consider truly vulnerable right now. These include all of the GOP seats we rate as Leans Republican, Toss-up, or at least leaning to the Democrats already. As of now, these seats, along with a handful of currently Democratic seats, represent the true House battlefield. Because Democrats need to net 30 seats to actually win the House, even winning all of these seats and holding their own -- which is very unlikely at this point -- would still leave them several seats short of a majority. The 28 GOP seats are, on average, fairly representative of the nation. President Obama's mean performance in these 28 seats in 2012 was 51%, the same as his national share of the vote. A few of these seats are significantly more Democratic than the nation: Obama got 61% in both FL-10 and VA-4, open seats that mid-decade redistricting turned into Democratic bastions that the current Republican incumbents abandoned to run elsewhere. But for the most part, Obama performed just a little bit above or below his national performance in these seats. But there's one major outlier on our list of truly competitive Republican-held House seats: UT-4, held by first-term Rep. Mia Love (R). Obama got just 30% there in 2012. To put that in perspective, the most Republican-leaning district held by any Democrat is MN-7, Rep. Collin Peterson's seat, where Obama got 44%. UT-4 is an extreme outlier, and remarkably, we're actually moving its rating toward the Democrats this week, from Leans Republican to Toss-up. The reason is that the topline presidential number does not tell the whole story in UT-4. Former Rep. Jim Matheson (D), a classic blue dog moderate Democrat, held the seat or a version of it for more than a decade. He even withstood 2012's Mitt Romney Utah wave, which washed over the Mormon-dominated Beehive State. Matheson beat Love in 2012 and then retired in advance of the 2014 election, giving Love, a favorite of national Republicans, a seemingly clear shot at the House. But Love underperformed in 2014, winning by just five points against Doug Owens (D), who like Matheson is a member of a prominent Utah Democratic family. Owens is back for a rematch, and there are several signs that this will be a competitive race. For one, Owens is keeping better pace on the money front: Love outspent him more than five to one in 2014, but this time they are relatively close on cash on hand, $1.1 million for Love to about $770,000 for Owens. Additionally, the presidential race could hurt Love: While Trump should eventually win Utah, a recent poll showed the Clinton and Trump tied statewide 15 -- and Love trailing Owens by six 16. That seems like a rosy projection for Democrats, but it's yet another signal the race should be close, and Romney's 2012 performance makes this district seem more Republican than it is. John McCain won 56% there in 2008. That's still better than McCain performed in any other current Democratic district, but it's also a far cry from Romney's 68% four years later. -- In California, where votes from last week's primary are still being counted, Democrats are pleased that Bryan Caforio, an attorney, advanced to the general election against Rep. Steve Knight (R, CA-25) in last week's all-party primary. A surprisingly weak 10-point win by Knight's predecessor, former Rep. Buck McKeon (R), in 2012 against a little-known opponent provided some evidence that the district, which Romney won by two points in 2012, was trending Democratic, and that trend has only continued over time. National Democrats seem prepared to play here, and Republicans are so weak right now in California that their grip on districts that are much more Republican than the state as a whole may be loosening. Knight remains the favorite, but we're moving this race from Likely Republican to Leans Republican. -- Democrats caught a break in Nevada on Tuesday night in the open NV-3, which Rep. Joe Heck (R) is leaving to run for Senate. The top potential Republican candidate, state Senate Majority Leader Michael Roberson, lost a primary to Danny Tarkanian, the son of former UNLV basketball coach Jerry Tarkanian and a perennial candidate. Tarkanian has had some success in primaries but has lost several recent general elections. The Democratic nominee is Jacky Rosen, a synagogue leader. This is a swingy district that Obama won by less than a percentage point in 2012. Perhaps this is finally a chance for Tarkanian to make a breakthrough, but NV-3 is a diverse district where Trump probably will do worse than Romney did. So we're moving this open seat from Toss-up to Leans Democratic. -- As noted above, Rep. David Jolly (R, FL-13) appears poised to leave the Senate primary and run for reelection to his House seat. If he does and wins the primary, he would likely face ex-Gov. Charlie Crist (D) in a reconfigured Tampa-area district where President Obama won 55% of the vote in 2012. Crist won election as governor in 2006 as a Republican, lost a Senate race as an independent to Rubio in 2010 (after Rubio forced him out of the GOP primary), and then lost a very close election for governor as a Democrat in 2014. Jolly won a high-profile special election in 2014 against 2010 gubernatorial nominee Alex Sink (D) in a FL-13 that was less Democratic than the current one. We currently call FL-13 Likely Democratic, but in the event that Jolly runs for reelection, we will move the race to Leans Democratic. One could argue that Toss-up is the more appropriate rating: St. Pete Polls had the race tied at 44% apiece in a recent survey 17, and Jolly's net favorability was much better than Crist's. It's possible that FL-13, which backed Crist in the gubernatorial race, is nonetheless afflicted with Crist fatigue. But the seat is tough for Republicans as currently drawn, and Trump could end up making it even tougher if he underperforms. Additionally, Jolly does not get along with the National Republican Congressional Committee. Even while Jolly was winning in 2014, his relationship with national Republicans was rocky, and he didn't help matters by participating in a 60 Minutes piece that showed undercover footage of members dialing for dollars, which enraged the NRCC 18. Still, if the NRCC sees a path to victory, it probably will spend big in the race, albeit through clenched teeth: After all, Jolly is an incumbent, and both party congressional campaign arms are first and foremost for incumbent protection. Jolly has proposed banning lawmakers from personally soliciting donations, which seems to have only depressed his own fundraising: As of the most recent fundraising reports (March 31), Crist had slightly more cash on hand than Jolly, even though Jolly was running for Senate in a huge state while Crist was just running for one of the state's 27 congressional districts. All that said, Jolly's potential move back to the House race would give the Republicans a real chance to win a district that appeared lost. And even if Jolly didn't win, national Democrats very well might have to expend resources on a seat that might have otherwise been a walk. Our full House ratings are available here 19.